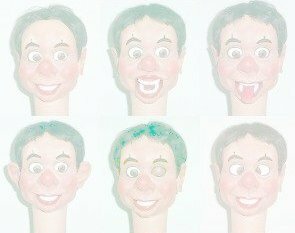 I am a big fan of the late Brian Hamilton and have quite a few of his figures in the Ventriloquist Central Collection and I love the fact that he is a direct descendant of the McElroy Brothers. They did teach him some of their methods. The head casting which I am showing you is a fiberglass cast of a rendition Brian did of the McElroy's figure Ezry, which was renamed Olie, and Olie is now owned by Jeff Dunham. This head casting is full size and although not exact it sure does have a very close resemblance to the original. Give it some whiskers and it is Ezry. The paint is Brian's work and I am happy to have it as part of the Ventriloquist Central collection.